In this chapter, we review a set of key research problems and methods in analysing ‘omics’ data, gene expression, proteomics, metabolomics, and lipidomics. 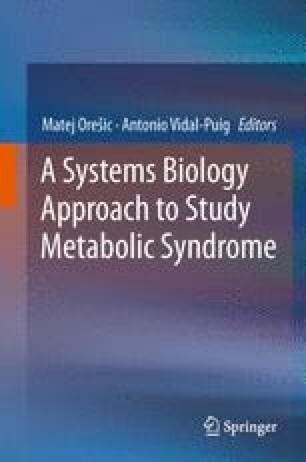 We start with the common systems biology approach to study metabolic syndrome, as well as any other disease, namely comparative case-control setting. The setting is usually an over-simplification, since there are other covariates that affect the concentrations of molecules, for instance drug treatments, gender, body mass index (BMI), and time in time-series experiments. Given these covariates, the setting becomes a multi-way experimental design. When multiple data sources are available, such as several ‘omics’ types, multiple tissues or multiple species, each forms a different data space with different molecules or variables, bringing in the problem of data integration. We start by giving a brief tutorial on the commonly used basic univariate and multivariate statistical approaches applicable if the problem is simplified by stratifying to a case-control design. We then focus on the multi-way setups of the Analysis of Variance (ANOVA) type, and in particular their main difficulty for ‘omics’ data: the large number of variables compared to the small number of observations. We introduce a recent family of Bayesian methods that is able to deal with multi-way, multi-source data sets and to translate biomarkers between multiple species. The approach is able to handle small sample-size combined with high dimensionality, and it allows a rigorous estimation of uncertainty of the results.